Hopefully, your long line work will progress until you are ready to try some off-leash work. You should first be comfortable with giving your dog a lot of freedom on the long line. You may want to gradually reduce your and your dog's dependence on the long line by reducing its weight and its length, until your dog is dragging a three-foot piece of lightweight cord. Your chances of being successful when you take your dog off leash can be increased by setting up the situation to your advantage. Choose the best place and the best time. First of all, dogs always come better when called in unfamiliar places. Some suggestions for testing your dog's training are a friend's fenced backyard or a tennis court that is entirely fenced. If you are starting in an unfenced area, make sure you are far from a road. Watch out for wildlife that your dog might chase. I prefer to use a trail in a wooded area rather than a big, open field. The disadvantage of an open field is that a dog can see farther than in the woods and may chase something he sees quite a distance away. 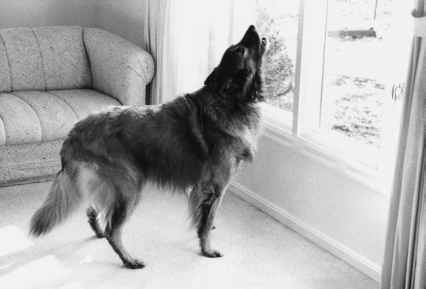 Dogs can detect movement farther away than people can. Also, your dog can get quite a distance from you yet still have the security of being able to see you. The turns in a wooded trail help prevent a dog from getting too far ahead because he won't be able to see you. The best time to try your dog off leash is in warmer weather. The heat will decrease his endurance. It helps if your dog has already been thoroughly exercised before you take the leash off. An hour's worth of jogging would be best, but if that's not possible, try a long walk in the area where you intend to let him off leash. Increase your dog's motivation by bringing special food treats with you and making sure he is hungry. Don't use your everyday training treats. How would your dog feel about slices of pepperoni? I'll never forget what one student brought for her dog's first time off leash. The dog was a Borzoi who had been kept on a chain in the backyard most of his life. He and his owner had successfully completed a basic obedience class. When she showed up at the place at which we had decided to meet, she got out of the car with an entire roasted chicken wrapped in aluminum foil! It helps to have dogs along who are very good about coming when called and don't like getting far from their owners. Having other dogs to play with will motivate your dog to stay with the group. The first time Shannon, an adult Golden Retriever/Irish Setter mix, was taken off leash is a good example of setting up the situation for success. Shannon lives with her owner at a horse stable. Unfortunately, even though Shannon lived on several acres, whenever she got loose outside, she ran across the road. When her owner finally caught her after a long chase, he punished her. This resulted in Shannon staying away longer and longer, and becoming harder and harder to catch. It also resulted in Shannon's gaining a tremendous amount of weight from lack of exercise. After some basic training, we were ready to try Shannon off leash. We started out by jogging her on leash about a mile on a warm day. Because Shannon had received little exercise lately, she was in poor shape and got tired easily. Then we walked Shannon to the far end of the stable property along with two dogs who were friendly with other dogs and pretty good about coming when called. Shannon's owner filled his pockets with slices of hot dogs and made sure Shannon knew they were there. Then we turned Shannon loose and started walking. It is much easier to keep a dog with you if you are walking somewhere than if you are just standing still. If you are walking, your dog is occupied with keeping up with you and cannot get too distracted—but if you stand still, many dogs will gradually drift away and become involved in pursuing their own interests. Shannon did fine. Her owner called her back every couple of minutes, gave her a slice of hot dog, and released her to continue playing. The hardest part was keeping her owner from panicking every time Shannon got more than a few feet away. When we walked back and got close to the road, we called Shannon in and put her on leash. Shannon cannot be turned loose at the stable without supervision, as their previous dog could, but at least she can get some exercise off leash. Once you have been successful in letting your dog off leash, you have broken the cycle of your dog running away because of lack of exercise and freedom. Prevent the cycle from starting again by keeping him exercised. It is helpful to occasionally let your dog run until he is tired, instead of stopping when you want to quit. You can gradually give him more freedom in more challenging situations. There are over a hundred registered breeds of dogs. Recognizing the type of the dog is basically associated with its breed. A purebred animal belongs to a documented and acknowledged group of unmixed lineage. Before a breed of dog is recognized, it must be proven that mating two adult dogs of the sametype would have passed on their exact characteristics, both appearance and behavior, to their offspring.